This article is about the American novelist. For the former mayor of Los Angeles, see Richard Riordan. For the Australian politician, see Richard Riordan (Australian politician). Richard Russell Riordan Jr. (/ˈraɪərdən/; born June 5, 1964) is an American author. He is known for writing the Percy Jackson & the Olympians series, about a twelve-year-old Percy Jackson who discovers he is a son of Greek God Poseidon. His books have been translated into 42 languages and sold more than 30 million copies in the US. 20th Century Fox has adapted the first two books of his Percy Jackson series as part of a series of films. His books have spawned related media, such as graphic novels and short story collections. Riordan's first full-length novel was Big Red Tequila, which became the first book in the Tres Navarre series. His big breakthrough was The Lightning Thief (2005), the first novel in the five-volume Percy Jackson series, which placed a group of adolescents in a Greco-Roman mythological setting. Since then, Riordan has written The Kane Chronicles trilogy and The Heroes of Olympus series. The Kane Chronicles (2010-2012) focused on Egyptian mythology; The Heroes of Olympus was the sequel to the Percy Jackson series. Riordan also helped Scholastic Press develop The 39 Clues series and its spinoffs, and penned its first book, The Maze of Bones (2008). His most recent publications are three books in the Magnus Chase and the Gods of Asgard series, based on Norse mythology. The first book of his The Trials of Apollo series based on Greek mythology, The Hidden Oracle, was released in May 2016. Riordan was born and raised in San Antonio, Texas. He graduated from Alamo Heights High School, and first attended the music program at North Texas State, wanting to be a guitarist. He transferred to the University of Texas in Austin and studied English and History; he received his teaching certification in those subjects from the University of Texas in San Antonio. He taught English and Social Studies for eight years at Presidio Hill School in San Francisco. Rick married Becky Riordan, originally from the East Coast, in 1985 on the couple's shared birthday. They have two sons, Haley and Patrick. It was Haley Riordan who inspired the Percy Jackson series as a bedtime story. They moved from San Antonio to Boston in June 2013, in conjunction with older son Haley starting college in Boston. Riordan has created several successful book series. Tres Navarre, an adult mystery series about a Texan private eye, won the Shamus, Anthony, and Edgar Awards. He conceived the idea for the Percy Jackson series as bedtime stories about ancient Greek heroes for his son Haley. Haley had been diagnosed with ADHD and dyslexia, inspiring Riordan to make the titular protagonist ADHD and dyslexic. Riordan published the first novel in the series, The Lightning Thief, in 2005. Four sequels followed, with the last, The Last Olympian in 2009. Prior to Percy Jackson, Riordan had written the Tres Navarres series, a series of mystery novels for adult readers. His Percy Jackson and the Olympians series features the titular twelve-year-old who discovers he is the modern-day son of the ancient Greek god Poseidon. Twentieth Century Fox purchased the film rights and released a feature film in 2010. Following the success of Percy Jackson, Riordan created The Kane Chronicles, which features a modern-day Egyptian pantheon and two new sibling protagonists, Sadie and Carter Kane. 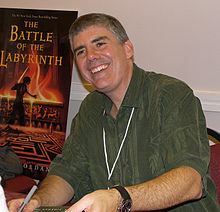 Riordan also created a sequel series to Percy Jackson, The Heroes of Olympus. Riordan also helped create the children's book series The 39 Clues; he authored several of its books, including The Maze of Bones, which topped The New York Times Best Seller list on September 28, 2008. He also wrote the introduction to the Puffin Classics edition of Roger Lancelyn Green's Tales of the Greek Heroes, in which he states that the book influenced him to write his Greek mythology series. Published individually first, then as an anthology titled Demigods and Magicians in 2016. In September 2016, Disney-Hyperion announced a new Rick Riordan imprint. The imprint is called "Rick Riordan Presents", and was launched in March 2018. It is headed by Riordan's editor, Stephanie Owens Lurie. The imprint will not publish books written by Riordan, "whose role will be closer to curator". In an interview with the Iowa Gazette, Riordan said, "instead of me writing all of the mythologies we are going to look for authors who already are writing about that stuff. If I feel like I can recommend them [to my readers] ... we’re going to have them out here in the spotlight." A focus will be placed on "diverse, mythology-based fiction by new, emerging, and under-represented authors". Lurie expressed hopes that the imprint will help satisfy Riordan fans, without asking the author to write more than his usual two books a year. ^ "Rick Riordan ID Card". Puffin Books. Archived from the original on September 28, 2011. Retrieved April 13, 2012. ^ Lodge, Sally (August 18, 2011). "First Printing of Three Million for New Percy Jackson Book". Publishers Weekly. Retrieved August 18, 2015. There are 30 million copies in print in the U.S. of the novels in the author's three series for Disney-Hyperion: Percy Jackson & the Olympians, The Kane Chronicles, and The Heroes of Olympus—and the books have been translated into 37 languages. ^ Italie, Hillel (September 1, 2008). "'Potter' publisher looks to promote next big thing". Fox News Channel. Retrieved April 26, 2009. ^ a b "Read an excerpt from new Rick Riordan". June 18, 2015. Retrieved July 28, 2015. ^ "Two Days in the Bay Area | Rick Riordan". Retrieved 2019-01-21. ^ "Celebrating 100 Years | Presidio Hill School". www.presidiohill.org. Retrieved 2019-01-21. ^ a b "Update from Athena House". June 12, 2013. Myth & Mystery: The official blog for author Rick Riordan (rickriordan.blogspot.com). Retrieved November 14, 2015. ^ Riordan, Rick (January 26, 2014). "Mystery man". Boston Globe Magazine. The Boston Globe (bostonglobe.com). Retrieved February 21, 2014. ^ "Big Red Tequila". Powells Bookstore. Retrieved April 26, 2009. ^ Williams, Sally (February 8, 2010). "Percy Jackson: My boy's own adventure". The Guardian. Retrieved January 3, 2014. ^ "About the Author". powells.com. Retrieved November 12, 2009. ^ Minzesheimer, Bob; Craig Wilson (January 13, 2011). "Book Buzz: Riordan's 'Fire' ignites May 3 and a big week for e-books". USA Today. Retrieved January 22, 2012. ^ "Children's Books". The New York Times. September 28, 2008. Retrieved April 26, 2009. ^ Lancelyn Green, Roger (1958). Tales of the Greek Heroes (3rd ed.). Puffin. pp. v–vi. ISBN 9780141325286. ^ "Shamus Award Winners". The Private Eye Writers of America. Retrieved September 7, 2015. ^ "Anthony Award Nominees and Winners". Bouchercon. Retrieved September 7, 2015. ^ "Category List – Best Paperback Original". Edgars Database. Mystery Writers of America. Retrieved September 7, 2015. ^ "Edgar Allan Poe Awards". book.consumerhelpweb.com. Archived from the original on October 12, 2009. Retrieved April 26, 2009. ^ a b "Mark Twain Award Previous Winners". Missouri Association of School Librarians. Retrieved January 21, 2012. ^ Riordan, Rick. "2009 Rebecca Caudill Award - Acceptance Letter from Rick Riordan" (PDF). Rebecca Caudill Young Readers' Book Award. Retrieved January 21, 2012. ^ Jones, Trevelyn; Luann Toth; Marlene Charnizon; Daryl Grabarek; Joy Fleishhacker (December 1, 2010). "Best Books 2010". School Library Journal. Archived from the original on January 1, 2011. Retrieved January 22, 2012. ^ a b "Children's Choice Book Awards Winners Announced!". Children’s Book Council. May 3, 2011. Archived from the original on September 29, 2011. Retrieved October 19, 2012. ^ "Soaring Eagle Book Award - Nominated Authors 1986 - 2014 Nominees" (PDF). Campbell County Public Library System. p. 5. Retrieved February 21, 2014. ^ "Previous Winners". The Milner Award. Retrieved June 4, 2012. ^ "Indian Paintbrush Book Award by Author Name 1986 - 2014 Nominees" (PDF). Campbell County Public Library System. p. 8. Retrieved February 21, 2014. ^ "'Magnus Chase and the Gods of Asgard: The Hammer of Thor' and 'If I Was Your Girl' win 2017 Stonewall Children's and Young Adult Literature Award". ALA News. American Library Association. January 23, 2017. Retrieved May 28, 2017. ^ "Additional ALA Awards 2017". The Horn Book Online. The Horn Book Magazine. January 23, 2017. Retrieved May 28, 2017. ^ Roback, Diane (January 23, 2017). "Barnhill, Steptoe, 'March: Book Three' Win Newbery, Caldecott, Printz". Publishers Weekly Online. Publishers Weekly. Retrieved May 28, 2017. ^ "Winners of the 2017 Youth Media Awards | ALA Midwinter 2017". School Library Journal: Industry News. School Library Journal. January 23, 2017. Retrieved May 28, 2017. ^ "The Percy Jackson Coloring Book – Rick Riordan". rickriordan.com. Retrieved 2016-07-10. ^ a b c d "Rick Riordan Announces New Books for 2018". readriordan.com. Retrieved 23 February 2018. ^ Riordan, Rick; Venditti, Robert (2017-02-21). The Heroes of Olympus, Book Two, The Son of Neptune: The Graphic Novel. Disney-Hyperion. ISBN 9781484716212. ^ Riordan, Rick; Collar, Orpheus (2017-10-03). The Kane Chronicles, Book Three, The Serpent's Shadow: The Graphic Novel. Disney-Hyperion. ISBN 9781484782347. ^ a b "Rick Riordan announces 'Trials of Apollo' series set in Percy Jackson's world". Hypable. Retrieved 2015-10-07. ^ "The Sword of Summer". ReadRiordan.com. Disney-Hyperion. Retrieved July 28, 2015. ^ Riordan, Rick (2016-08-16). For Magnus Chase: Hotel Valhalla Guide to the Norse Worlds: Your Introduction to Deities, Mythical Beings, & Fantastic Creatures. Disney Hyperion. ^ Riordan, Rick. "For Magnus Chase: Hotel Valhalla Guide to the Norse Worlds". Series Info: Magnus Chase and the Gods of Asgard. Rick Riordan. Retrieved September 13, 2016. ^ "9 from the Nine Worlds Cover Revealed". readriordan.com. Retrieved 23 February 2018. ^ "The Trials of Apollo – Rick Riordan". rickriordan.com. Retrieved 2017-05-29. ^ Riordan, Rick (2018-05-01). The Trials of Apollo, Book Three: The Burning Maze. Disney Hyperion. ^ a b c d e Corbett, Sue (September 13, 2016). "Disney Announces New Rick Riordan Imprint". Publishers Weekly Online. Publishers Weekly. Retrieved May 28, 2017. ^ Kuennen, Alyson (October 31, 2016). "Rick Riordan brings stories to Iowa City". TheGazette.com. The Iowa Gazette. Retrieved May 28, 2017. ^ a b c Riordan, Rick (26 April 2017). "Rick Riordan Presents". ^ a b c d e f Riordan, Rick (29 August 2018). "Rick Riordan Presents - The Latest News!". ^ Chokshi, Roshani (27 September 2018). "Aru Shah and the Song of Death". Art at Our Doorstep: San Antonio Writers and Artists featuring Riordan. Edited by Nan Cuba and Riley Robinson (Trinity University Press, 2008). Wikimedia Commons has media related to Rick Riordan.